* Above example is based on a Morioka departure. Tickets can also be bought for a Kuji and a Ninohe departure. * This ticket is a joint-collaborated promotion between Sanriku Railway, IGR (Iwate Galaxy Railway Co., Ltd.), Northern Iwate Transportation, Inc. and JR Bus Tohoku Co., Ltd.
Tickets may be used for 3 days from the first day of use. 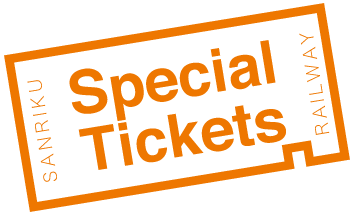 Tickets may be purchased up to 1 month prior to the first day of use (but only during the sales period). 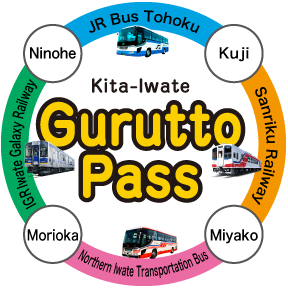 This is a discount ticket which allows passengers to travel between Morioka and Ninohe using the IRG Iwate Galaxy Railway; between Ninohe and Kuji using the JR Bus Tohoku (“Swallow”), between Kuji and Miyako on the Sanriku Railway; and between Miyako and Morioka using Northern Iwate Transportation Inc. (106 Express Bus). * An example of buying the ticket for a Morioka departure: A Morioka departure, Kuji departure, and Ninohe departure are possible. * The ticket is jointly planned by the four companies of Sanriku Railway Company, IGR Iwate Galaxy Railway Co., Ltd., Northern Iwate Transportation Inc., and JR Bus Tohoku Co., Ltd.